One tourist guide I saw promotes Dymond as “the jewel of Temiskaming”. While I think Earlton gives them a serious run for their money in the “jewel” department, Dymond is a nice little township of farms, big box stores, and fast food restaurants, where English and French are both spoken approximately equally. I thought that Dymond was in the Tri Towns but really it’s not, as the name refers to Haileybury, New Liskeard, and Cobalt. Dymond was forced to merge with New Liskeard and Haileybury in the 1990s to form the municipality of Temiskaming Shores. It is technically the oldest of the three townships, as it was founded in 1901. Dymond has relied on its agricultural base to withstand the boom-bust economic of northern Ontario, and to this day retains a distinctly agricultural feel…that is, once you get past the strip malls. Dymond has recently become a big-box-store, fast food, and motel haven. Dymond is essentially the last spot to do any real shopping on Highway 11 between North Bay and Thunder Bay without taking a fairly major detour off Highway 11 into Timmins. (I hope this doesn’t draw business away from New Liskeard’s fairly quaint downtown.) There’s a Walmart, a Zellers, a fairly big Canadian Tire, a new steak restaurant, and a number of different fast food outlets including McDonald’s and the last Harvey’s on the whole of Highway 11. This is important so let me re-ierate this – if you’re travelling west toward Thunder Bay, Dymond has the last Harvey’s on the whole of Highway 11. There isn’t a tonne to do in Dymond – most visitors would be likely to skip it for New Liskeard or Haileybury. However there is a golf course and some hiking available – stop at the tourist building on Highway 11b for more info. There is also the Little Claybelt Homesteaders Museum, chronicling the rise of agriculture and the founding of the Tri-Town. On main Highway 11 (west of New Liskeard) there is a little lookout with a nice view of the Tri-Town. 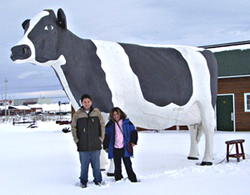 This entry was posted in Temiskaming and tagged big weird things, farm town by Highway11.ca Editor. Bookmark the permalink. I was born in New Liskeard in 1944 my birth cetificate says Dymond township ???? I intended to send you one very small word in order to say thanks a lot again with the nice secrets you’ve discussed on this page. It’s simply seriously open-handed of you to provide unreservedly all that a number of people could have distributed for an ebook to end up making some dough for their own end, most importantly considering that you could possibly have done it in case you decided. These pointers also worked as the fantastic way to fully grasp most people have a similar eagerness just like my personal own to learn whole lot more when it comes to this matter. I believe there are thousands of more pleasurable periods in the future for people who looked over your website. It reduces fats and carb absorption, reduces urge for food, stimulates the metabolism promoting fats burning and offers you extra vitality. There are various surgical methods to combat obesity. Having said that, the study has shown that just about anything that can maximize the metabolism, also can raise the weight reduction even if the human being is just resting. Only wanna input on few general things, The website style and design is perfect, the subject material is really superb : D.
why did you say dymond has a southern ontario feel,man we need places to eat and shop up here!! !